I wasn’t lying when I said I was having a serious moment with baking. It seems like every day my stomach demands a new baked concoction to satisfy my seemingly unending sweet tooth, and each day I willingly succumb to the cravings. You would think that after consuming a whole banana cream pie (recipe to come later! ), copious amounts of chocolate covered peanut butter balls, cupcakes, M&M cookies and an obscene amount of kourdabiedes in the last week that not only would I be sick of baking, but my palate wouldn’t be able to handle one more granule of sugar. But alas, that’s not the case. Perhaps it’s wishful thinking that the need to create hundreds of baked goods is a sign that labor is impending, but being two days past my due date, that rationalization seems a little far-fetched. The sweet tooth has gotten so bad, that last week, I had this insatiable longing for gingerbread – I don’t even like gingerbread. Or at least, I thought I didn’t like it. After daydreaming about a classic gingerbread cookie and a gooey blondie, I made it my mission to crank out one last recipe before I close the doors to the kitchen completely until this child decides to make his/her presence known. And the gingerbread blondie was born. I wasn’t even sure this recipe would turn out, since I got a little lazy in the development phase, but the stars seem to have aligned for me, because what emerged from the oven was a gooey, perfectly spiced, brown butter gingerbread blondie fit for a Martha Stewart-worthy cookie basket. The gooey factor in this blondie comes from the browned butter and the addition of one egg and one egg yolk, while the gingerbread essence comes from thick, syrupy molasses, plenty of ground ginger, cinnamon, nutmeg, and just a tiny pinch of cardamom. If you like your gingerbread a little more on the spicy side, add in a little bit more ginger and cinnamon, and vice versa for less spice. The key to making the perfect blondie not only lies within the ingredients, but also in the amount of time you cook the batter. Regardless of how much butter and eggs you use, if you overcook the batter, you’ll lose that gooey factor. I always error on the side of caution, and pull the blondies out when they look just a little bit underdone. Once they’re cool, slice and dust with plenty of powdered sugar, or, if you’re feeling ambitious, a brown butter cream cheese icing would take these over the edge…. 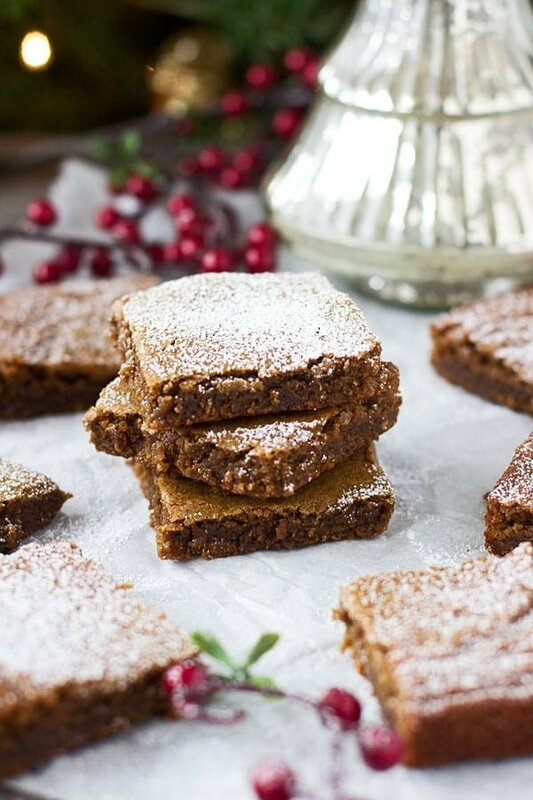 These gingerbread blondes are gooey, slightly spicy and perfect for holiday entertaining! Preheat oven to 350 degrees. Generously grease a 8x8 square baking pan. Add butter to a small skillet. Turn the flame on a medium-high and let the butter melt. Once the butter starts to brown, swirl the pan until the butter is a deep, golden brown and smells very nutty. Pour into a glass bowl and let cool for five minutes. Once the butter has cooled slightly, add brown sugar, eggs and molasses. Stir with a wooden spoon until combine. Pour batter into prepared pan and bake until top is set and batter is firm, but a toothpick comes out with some crumbs attached, 15-18 minutes.. DO NOT OVERBAKE! 16 Responses to "Brown Butter Gingerbread Blondies"
These look so crazy chewy!!! I love it! I NEED this in my life. I love the flavor of traditional gingerbread but not the texture, but these look dreamy! Gingerbread problems solved! 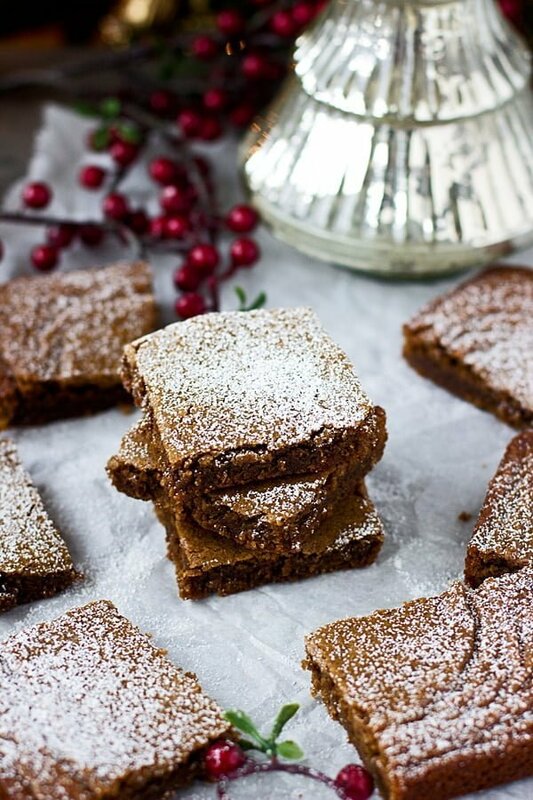 These gingerbread blondies look fantastic! Just what my holiday dessert table needs! These look so gooey and amazing! I love blondies, and especially gingerbread this time of year! Pinning! These look to die for! Brown butter and gingerbread?! Totally need to make these over the holidays! We all thank goodness for your sweet tooth because these look DIVINE!! Thinking of you friend and can’t wait for that sweet babe to make it’s appearance! It’s a good thing your taste buds came around to liking gingerbread because these look insanely delicious! These blondies sound incredible!! My dad is a big gingerbread fan… I know he’ll love them! And I can’t wait to “meet” (i.e. see photos) of little Cooking For Keeps! So excited for you guys! How would you go about doubling this recipe. I am a very novice baker. What size pan, baking temp/times? Thank you. Just use a 9×13 pan! I haven’t tried it, but that should work! I made them this past weekend! Double batch 9×13 pan they were Incredible but definitely 18min cook and 15 min resting wasn’t enough for larger pan. I had to go by eye checking with 5 min additional cook times. I ended up taking out at 28mins and still could used couple more mins. Because after 20 min resting had hard time cutting. However, the next day they were fantastic! Everyone loved them. I love the recipe and have also added diced candied ginger AND ginger extract! I also am wondering whether you have used light or dark brown sugar. I love that there is both brown sugar AND molasses, some people only do one or the other. But i’m finding the middle a little undercooked. The edges, top & bottom are perfect so I’m not sure what to adjust! It’s supposed to seem a little undercooked! Yeah, I meant “relatively undercooked even for this type of recipe” 😉 BUT! Solved by baking in fancy muffin/cupcake tins, adjusting time as usual for different pan. Thank you! This is an excellent recipe that succeeded despite my best efforts. I sliced one off for myself much too early and they were still practically liquid despite passing the toothpick test. Worried that my slicing may have ruined them, I stuck them back in the oven to try and firm them up more, but instead started to see fats leeching out of them. I hurriedly removed them from the oven and stuck them in the microwave after reading that they generally cook things from the inside out, opposite to that of an regular oven. A minute of microwaving managed to spread a whole new brownie out into the space where I had sliced my first one out. I was contemplating not serving this to anyone until I got over my frustration and simply decided to refrigerate them covered in plastic foil — which fixed everything. 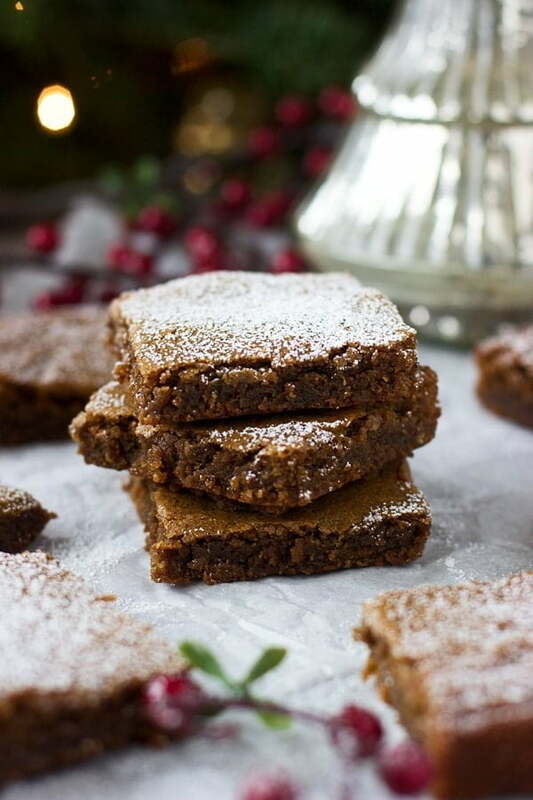 Solid, dense, delicious gingerbread blondies! I had never tried browning butter before and was scared to try, but it rounds out the flavor profile very nicely. The cut marks even filled in while the mixture was still fluid, creating a nice pattern of thin light crust and the darker material which did not have time to form crust. I plan to serve these for Christmas today and imagine they will go over well. For future readers who do not check the comments, I would highly recommend you include a warning to resist the temptation to immediately slice into them. It seems like the cooling phase is a important part of properly preparing this recipe and should be ignored at the cook’s peril. I imagine the actual cooling method is quite flexible: could be indoors or outdoors as long as you take precaution against fridge odors and/or pests. Thanks for the excellent recipe and I hope to make it again soon!